***CellSocket is NOT an interface for credit card readers, modems, fax machines, or satellite TV systems. Add $10 for ground shipping and handling on all single orders. Overnight & 2nd day delivery available at extra cost. Identical unit to 61622, but only works with Nokia 6310i & 6360 phones. a replacement for the antenna that comes with the both units. The Cell Phone Dial Tone must be connected to either a single dedicated conventional wired/cordless phone or an unused land-line network (i.e. vacant Line-2 in your home or business phone switching equipment) on your premises to operate. Do NOT connect the Cell Phone Dial Tone directly to an active (telephone company) land-line under any circumstances! Answering machines, Key Systems, and PBX units will only work with the 61622 and newer Cell Phone Dial Tone because they have dial tone with calling party disconnect. It is always recommend that you use your cell phone's voice mail for best messaging results. Voice quality and proper operation of your Cell Phone Dial Tone is dependent on the signal quality of your cell phone reaching the nearest cell site. Many inside locations may not require an external antenna for the Cell Phone Dial Tone to work properly. If your cell phone works well at the location that the Cell Phone Dial Tone will be placed (3 or 4 bars or upper 3/4 or higher on the phone's signal strength meter) then you don't need an external antenna. With marginal signal strength at the planned location ( 2 bars or middle) you should purchase an external antenna for best performance. A low signal strength (1 bar or 1/4 or lower) indicates the absolute need for an external antenna and possibly a powered signal booster. You should also try different indoor locations where you plan to place the Cell Phone Dial Tone to see if any of those locations improves the cell phone's signal strength before deciding on purchasing an external antenna. 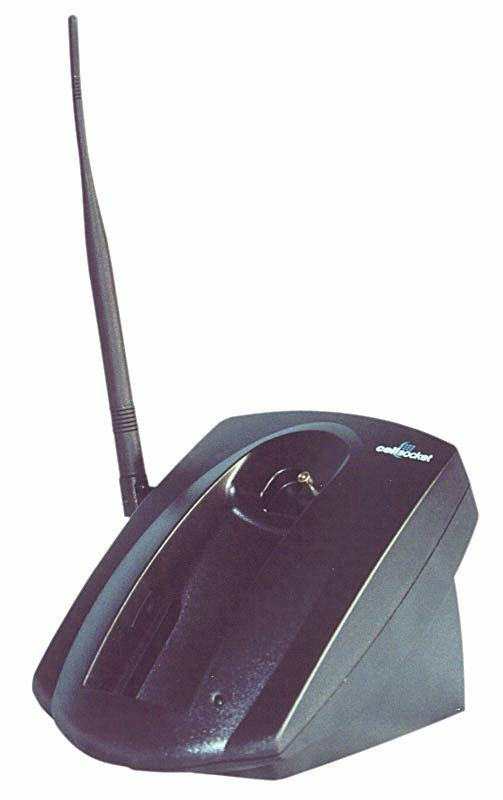 Both Units comes with a 3db gain dual band side mount antenna (See photo at left) packed in with the Cell Phone Dial Tone that attaches to the external TNC antenna connection on the side of the Cell Phone Dial Tone. (See photo above.) The cell phone's antenna is disconnected when placed in these CellSocket models. I can also supply a variety of external antennas, including Yagis, low-loss cables, and signal boosters depending on your needs and type of cellular service.